We are a leading service provider for the Diamond Authentication Report. We are hugely appreciated for our Diamond Authentication Report. 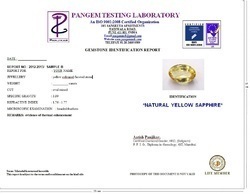 Since the beginning, We have been acknowledged as a world-class service provider of quality testing of gems. We furnish high-fidelity Diamond Report to our clients. Our professional gemologist cautiously examines all diamonds for precise diamond report. We have advanced lab with cutting edge machines that support our team for offering satisfactory result to our valued clients. Our services are most cost effective. Looking for Diamond Authentication Report ?